National's Simon Bridges' leadership could be in question amidst the turmoil caused by outgoing MP Jami-Lee Ross. The political rumble between the MPs has rattled some voters’ confidence in Bridges in his Tauranga electorate. Ministry of Primary Industries (MPI) has apologised for an incident where a whale bone necklace was seized at customs at Wellington Airport. The owner of the treasured taonga says the experience was upsetting. The Mika Haka Foundation held its annual Mana Wahine programme recently, connecting Māori and Pasifika women of influence with young women to help boost their self-confidence. Can the Black Ferns win back the trophy? Tonight, the Black Ferns depart for Ireland for the 2017 Women's Rugby World Cup, with the big question lingering, can they win back the trophy? Moana Makapelu Lee caught up with the team this morning ahead of their departure. Actor and artist Mika (Ngāi Tahu) will stand in Auckland Central for the Opportunities Party in the election in September. Mika spent years on the frontline helping youth through the Mika Haka Foundation, which works in schools and the community to help young people through the performing arts and physical culture. Women's Refuge is supporting Green MP Jan Logie's private members bill which would allow victims of domestic violence paid leave from work. 32-year-old Kiritapu Allan is set to run in the race for East Coast in the general elections next year. Tamati Coffey hopes to stand again for the Labour Party at next year's elections, but this time in the Māori seat, Waiariki. Nominations within the party closed yesterday. The party has yet to formally accept his nomination but Coffey says the challenge has been set. 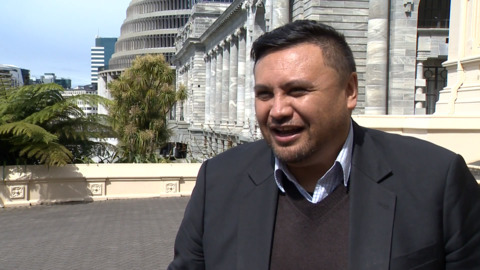 Māori Party president Tukoroirangi Morgan has confirmed the party has approached ‘high profile’ people to contest the Māori Party candidacy for the Tāmaki Makaurau electorate.